In 1866 Alexander Walker published a collection of 196 Fiddle tunes. The Titles are all listed below. A copy of his original book is held at The House of Newe by the descendants of Sir Charles Forbes. The frontispiece of the book contains a dedication to Sir Charles Forbes. The Publication was titled “A Collection of Strathspeys, Reels, Marches &c. for piano violin and violincello” composed by Alexander Walker and dedicated with permission to Sir Charles Forbes Bart. The book was published by John Marr of Aberdeen. 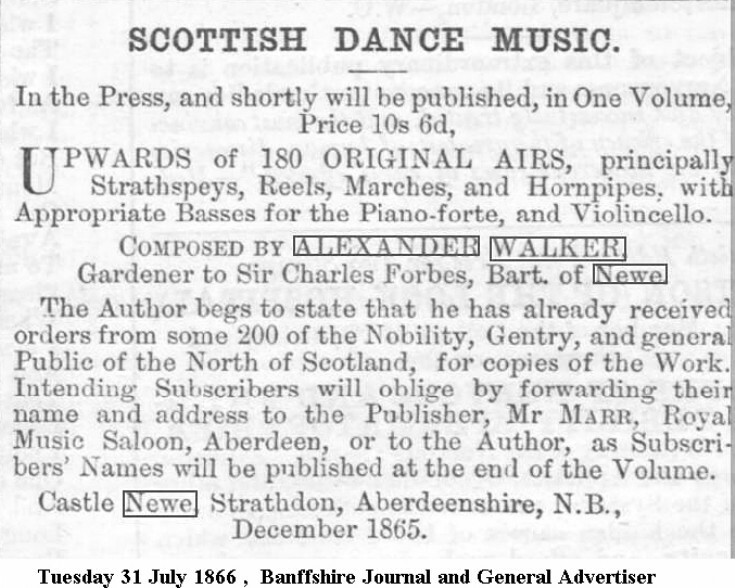 From the 'Dedication to Sir Charles Forbes' which prefaced his collection, it is clear that Alexander Walker's book contained predominately original music. Of the 196 tunes in the book only five were credited to other composers (Two to Alexander Troup, with one each to J. Steele and Hugh Inner, and one as collaboration between Walker and James Scott Skinner. Although he did not directly credit himself alongside each of the remaining melodies (perhaps he felt this redundant) are apparently all composed by himself. The titles certainly relate to Alexander’s life, to his Forbes family connections and to events and places connected with him (except for the last two titles to which I have yet to find any related history).